TDX is managing the complete re-cladding of the 1 million square foot Center 3 Building at LaGuardia Community College. The original terracotta building façade was failing and is being removed in its entirety. The façade will be replaced with a new glass and terracotta unitized curtain wall system which involves the removal of windows, associated asbestos abatement, and temporary partitions. The project requires meticulous planning and scheduling to protect building occupants and limit disruption of school activities because the classroom and office building is fully occupied daily from 8:00 am to 11:00 pm. The project also includes the replacement of the existing perimeter heating system and conversion to steam, and a renovation of the building lobby. 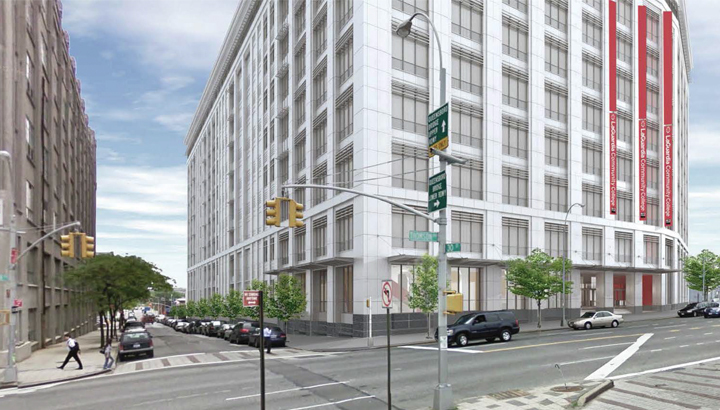 The project site is located at a busy pedestrian and vehicular intersection on Thompson Avenue in Long Island City. It has limited areas for staging, difficult access conditions and requires meticulous planning and execution to manage the site logistics.